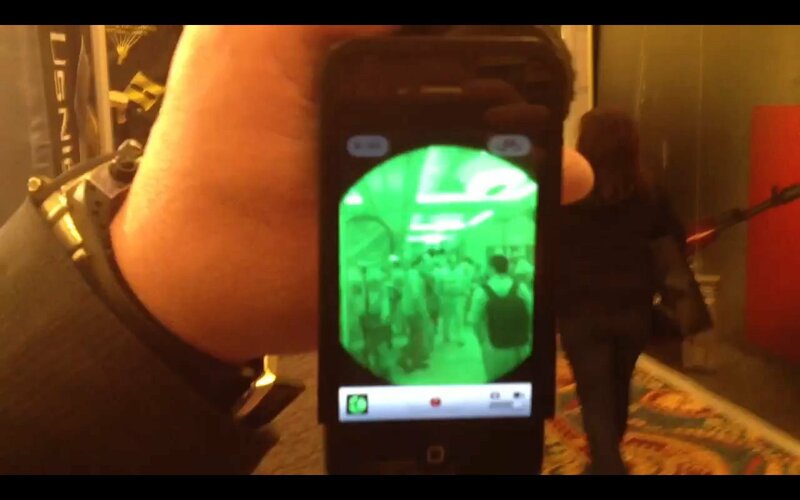 US Night Vision (USNV) iTelligent iPhone 4/4S / AN/PVS-14 Night Vision/I2 Monocular Adapter at SHOT Show 2012: Shoot Clandestine I2 Combat Video, Then Email or SMS Text It! (Video!) | DefenseReview.com (DR): An online tactical technology and military defense technology magazine with particular focus on the latest and greatest tactical firearms news (tactical gun news), tactical gear news and tactical shooting news. All screen-capture photos and video clips contained in this article were shot by DefenseReview.com (DR), and are copyrighted. DefenseReview.com owns the copyright on these materials. The (screen-capture) photos and video clips were shot in HD with an Apple iPhone 4S smartphone. 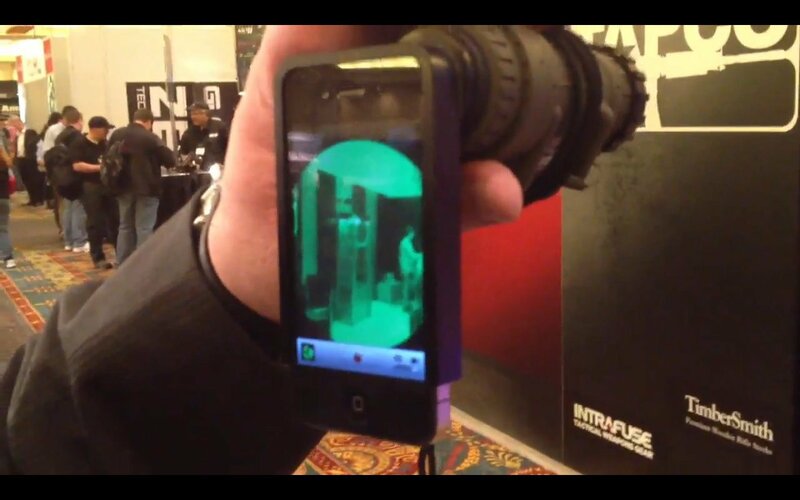 While we were shooting the proverbial…um…"stuff" with the boys from Falcon Operations Group (FOG) while loitering at the U.S. Night Vision (USNV) booth, someone alerted us to a pretty damn cool cool little iPhone 4/4S adapter for the AN/PVS-14 night vision/I2 monocular. U.S. Night Vision's David Rhomberg demonstrated it for DefenseReview (DR) at the booth, and we came away impressed, to put it mildly. The USNV iTelligent iPhone 4/4s/PVS-14 adapter allows you to essentially turn your ordinary, run-of-the-mill AN/PVS-14 monocular into an ultra-convenient little night vision/I2 camera. Just attach your iPhone 4S (or iPhone 4) to the monocular, start your video camera, and you're rollin'. Then, just email or text (SMS) the video clip to whomever. No muss, no fuss. Piece of cake! Perfect for military or law enforcement (LE) nighttime/low-light surveillance ops. Just don't use it to stalk your ex-wife. That's probably illegal. Oh, and the USNV iTelligent iPhone 4/4S/PVS14 Adapter is either already or will be available for a number of other latest-and-greatest smartphones out there, like the Samsung Galaxy S2, HTC EVO 4G, Blackberry Torch, etc. Editor's Note: DR would like to see US Night Vision make iPhone and other smartphone adapters for the BAE Systems/OASYS SkeetIR and StalkIR UTM (Universal Thermal Monocular) weapon sights. Wilcox Industries 5/8″ and .40″ Riser Weapon Mounts (Flip Mounts) for Aimpoint and EOTech HWS Combat Optics and 3X Magnifiers at SHOT Show 2012, and the Amazing 2012 New England Warrior Benefit/Gala!